Jomary “The Zamboanginian Fighter” Torres shocked the world this past August when the little-known atomweight from the Philippines made her promotional debut against rising Thai martial arts superstar Rika “Tinydoll” Ishige at ONE: KINGS & CONQUERORS in Macao, China. While the Thai standout has emerged as one of the most popular talents in Asia’s mixed martial arts scene, Torres stole the spotlight on that fateful night when she submitted Ishige in the second round of their exhilarating contest. Everything that Ishige threw at Torres, she withstood as the proud product of the Catalan Fighting Systems countered the Thai’s strikes and even successfully defended several submissions. However, the most telling moment was when Torres caught Ishige’s body kick in round two, where her confidence skyrocketed as the Filipina held onto the leg and landed blow after blow. Seeing a golden opportunity to get the finish, Torres swarmed with ferocious ground-and-pound blows as Ishige tried to cover up before finally using the position to lock in a match-ending rear-naked choke. “After the match, I was happy, but I did not know what to do. Do I celebrate or do I cry? I was really surprised because I did not expect the outcome. It was the first stoppage win of my career,” Torres recalled. The submission victory over Ishige shocked everyone in attendance, including Torres and her teammates. After her remarkable conquest of Ishige last August, Torres moves onto her next assignment as she faces Indonesian kickboxer Nita Dea on the undercard of ONE: HERO’S DREAM in Yangon, Myanmar on 3 November. 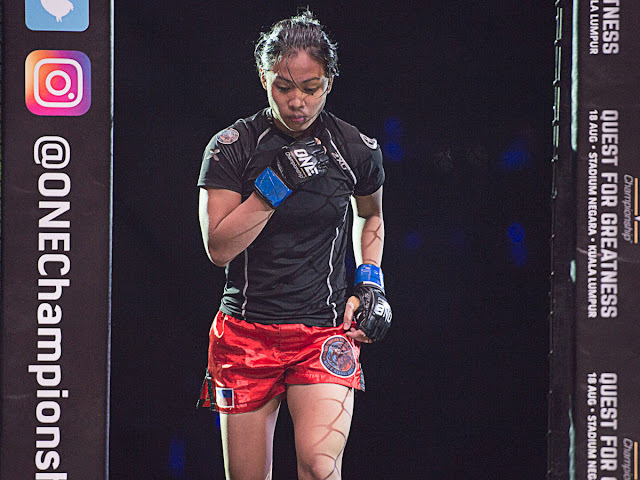 The 21-year-old Zamboanga del Norte, Philippines sees her three-round encounter against Dea as an opportunity to extend her success inside the ONE Championship cage. “This is my chance to establish my first winning streak in ONE Championship. It’s not impossible. That’s why I am exerting a tremendous amount of effort in training. I want to keep on winning,” she said. While the 26-year-old Indonesian may not have much experience inside the cage, Dea is actually a very accomplished martial artist. Dea is a national wrestling champion and a two-time national Wushu Sanda champion, who also a well-versed kickboxer with a 12-4 record in the discipline. “From what I saw, I think she (Nita Dea) is a striker. She does not seem to hit the ground all that much. I am prepared to go toe-to-toe or take the match to the ground, wherever I think I have the advantage,” Torres stated. Although she is riding a huge wave of momentum coming into her second bout as a ONE Championship competitor, Torres is confident that she will have her hand raised in triumph once again. “I felt really nervous in my first bout. But when I saw my opponent was right in front of me and remembered all the people who supported me, I relaxed and slowly put my focus on winning the match,” she shared. “I want to win again because I want to give back to my gym and the people who love and support me. I am competing for my country. Everything I do is for all of them and as long as I can do this, I will keep doing this,” Torres ended.